Gain weight, lose weight, repeat! This was the pattern that Furrybelly had experienced over the years. Then being faced with a medical procedure, and the dreaded reality of how much she weighed. 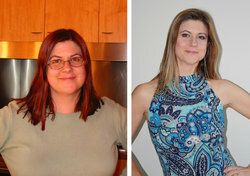 She decided right then to stop the yo-yo dieting and gain control of her eating and exercise habits and successfully lost 50lbs. I had struggled with being overweight most of my adult life and had gone through 3 or 4 weight loss cycles over the previous 25 or so years (ie: control eating and increase exercise to lose weight, stop exercising and put on weight). Each time ending a little heavier. This time (the final time… yes, it will be), I had to go into hospital for an operation and knew I would have to be weighed for the anesthetic administration. I was totally terrified and ashamed at what my weight would be. I could keep my head in the sand and pretend I didn’t notice my weight, but when you have an outsider evaluating you…well you can’t dodge that, can you? I had to do something. I never “dieted” as such. I always lost weight through cutting back portion sizes and making healthier choices. Also, I never crash dieted or did really low calories for an extended time so I am suppose I am lucky that I haven’t stuffed up my metabolism too much. It was never really the eating that did me in, it was lack of exercise. When I added vigorous exercise into the mix with sensible eating, the weight came off easily. However, something ALWAYS happened (finished university, changed jobs, moving house, unsustainable exercise regimen) that put a stop to my exercise routine – and then I’d put the weight back on again. Initially, just before my operation (6 weeks) I cut out all alcohol (hubby and I used to share a bottle of wine every night – naughty!). This alone, with a Curves gym routine 3 times a week, let me lose 1-2lb a week. After my operation, I was so pleased with my progress (and feeling like a new woman due to the operation itself) that I was motivated to continue my weight loss efforts. I have done enough calorie watching (if not counting) over the years to know what and how much I should be eating, so I just applied the knowledge – smaller portions, healthier food, better food choices. AND I continued religiously at the Curves gym 3 times a week. I eventually “graduated” to a “real” gym with free weights and cardio machines, but have nothing but good words for the Curves gym for beginner gym bunnies! I didn’t discover Calorie Count until after I reached a weight I was happy with, but I currently find the Calorie Count tools and community invaluable for topping up my knowledge of the calorie content of foods and recipes as well as reading all of the fantastic advice offered in the articles and forums. I wish I did know about it while I was losing weight because I am convinced it is VITAL to have a good idea of what you are consuming in order to lose weight. The tools and database available on the site are phenomenal. Honestly? Making up my mind, no, seriously making up my mind and committing to myself to lose weight. It all flowed from there. Slow and steady… The first 10kg came off faster (1-2lbs a week) and to be honest, I really didn’t feel different except the scales told me I was different. After that, loss was at 0.5 – 1lbs a week, sometimes less. I began to seriously notice at about 20lbs down when I had to purchase new clothes. 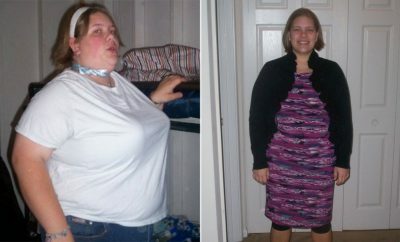 And then at 40lbs down (new clothes again) and then at 50lbs (new clothes AGAIN). I love new clothes! My weight hit about 126 lbs and stopped dropping. I have increased my food intake slightly but still eat and drink sensibly (mostly), but my weight hasn’t really increased over the last 2.5 years (except for 1- 2 lbs when I started seriously working the weights at the gym. Definitely muscle growth occurring. I can see it, feel it. I do feel successful now. I am successful! I will continue to be successful! Constant vigilance. I don’t tend to weigh myself as I find the minor ups and downs misleading. I do pay attention to how my clothes fit and try to respond appropriately if things are getting “snug”. By appropriately I mean looking at my diet and reassessing what is going into my mouth. I also religiously attend my gym 3 times a week plus walk at lunchtime for half an hour on 3 other days. Slow and steady loss for long term weight loss and have PATIENCE. I know no one wants to hear this, but it doesn’t make it any less true. To lose weight, you have to regulate what goes in (ie food) as well as what goes out (ie exercise). As far as I am concerned, you can’t do one without the other IN THE LONG TERM and achieve significant weight loss (and maintain it). Allow the occasional treat, food wise. It makes absolutely NO difference in the long run, so why deprive yourself. Stay away from the liquid calories. Just back away from the non-diet sodas, milk drinks and fruit juices (evil). Liquid calories don’t have the satiety values that “chewable” food does. Therefore, you either still feel hungry or are hungry soon after. Why would you do it? And, sorry to all the smoothie lovers out there, but I think they fall into the same category – may fill you for a little while, but doesn’t justify the calorie intake. Portion size. Your eyes are usually bigger than your stomach. Stop and think before you order/dish up your food. If you do have a cafe latte, get the small one. NO ONE needs 500mls (1 pint) of milky coffee unless you want to put on weight. Order the small size chips (fries). If you are still hungry, don’t worry, there is NOT a world-wide chip shortage. You CAN order more if you really want/are still starving. But I can guarantee that if you do order the large, you WILL eat them all. Same with dishing up your food at home. Put 2/3 or even 1/2 of what you THINK you want on your plate. Go away, eat it. If you want more, fine, go back out to the kitchen and get more. But DON’T have it there in front of you. You will eat it all. I know. 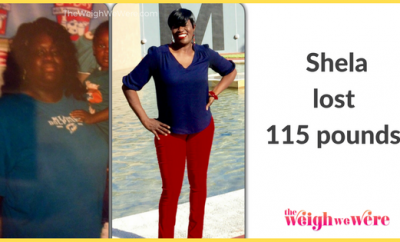 Next Story → Weight Loss Before and After: Kendra Found Zumba And Lost 151 Pounds! 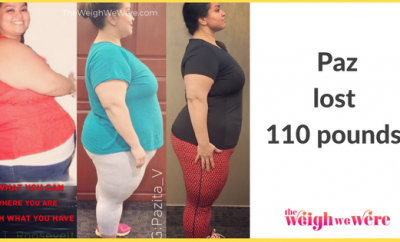 Weight Loss Success Stories: Karina Drops 100 Pounds And Goes From Obese to Triathlete!